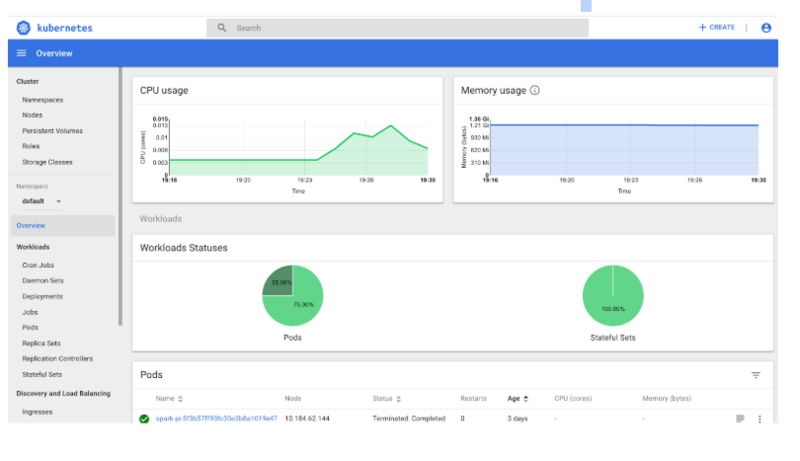 Originally developed by Google, Kubernetes is the open source container cluster manager. Who could have believed back in June 2014, when Kubernetes was first released, that it would become the de facto standard for container orchestration, and the foundation of choice for production cloud-native solutions? There were 388,100 comments on Kubernetes on GitHub during the past year, making it the most-discussed repository by a wide margin, with the number two discussed repository (i.e. Red Hat’s OpenShift Origin) coming in at 91,100 comments. There were 680 reviews of Kubernetes on GitHub, making it the second-most reviewed project during the past year. Kubernetes is used by 48% of companies that have more than 5000 employees. Basically, Kubernetes brings a cloud-native platform-as-a-service experience for auto-deployment and orchestration automation. Using Helm, developers can simply go to a marketplace, click on a button, and the most complex application is deployed, automatically, easily, and seamlessly. Developers get all the scaling, auto-recovery, and self-healing they need without the support of a team of DevOps experts. It is self-contained and offers unprecedented ease-of-use. 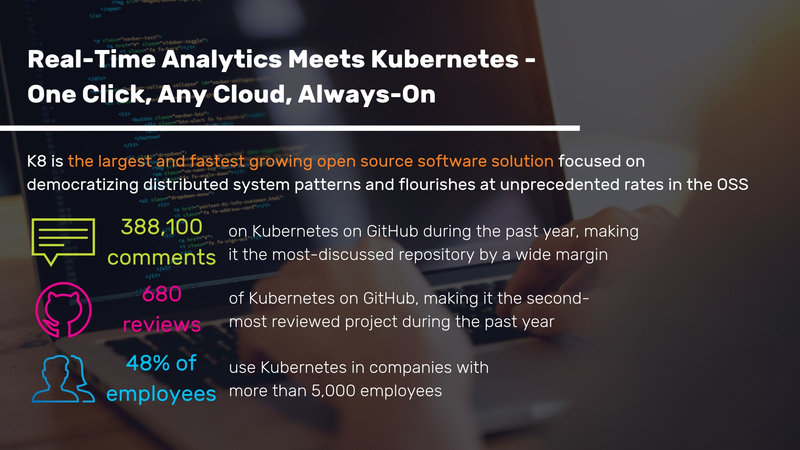 Kubernetes synergizes very well with InsightEdge, our in-memory, real-time analytics platform that brings together enterprise-class advanced analytics, machine learning, and extreme data processing. InsightEdge and XAP leverage Kubernetes’ anti-affinity rules to ensure that primary and backup instances are always on separate Kubernetes nodes (on separate physical machines). This high-availability design, combined with self-healing, load-balancing and fast-load mechanisms, assures zero downtime and no data loss. Additionally, rolling upgrades can be automated and implemented pod by pod using Kubernetes’ Stateful Sets. This allows for a smooth upgrade process with no downtime. Automatic scaling is supported, using predefined metrics along with CPU and memory utilization metrics to signal to Kubernetes when to scale up or down. Customized scaling rules according to personalized SLA, based on production needs, effectively balance the resources required to support the application requirements. All of this is achievable because Stateful Sets manage Pods that are based on identical container specifications. These Stateful Sets maintain a sticky identity for each of their pods, which are created from the same specification but are not interchangeable. Namely, each has a persistent identifier that is maintained across any rescheduling. Through the persistent volume driver, the platforms’ intelligent MemoryXtend multi-tier storage offering lets customers configure data prioritization according to the application’s business logic. This ensures that the most relevant data resides in the fastest data storage tier for optimized TCO. Deploying InsightEdge in a Kubernetes environment provides a seamless, automated, cloud-native experience. With just one click the platform is installed, deployed, and up and running. All you need to define is the desired Kubernetes cluster and how much data capacity is needed. That’s it. Let’s take a look at what makes this happen and how you too can make it happen, easily and seamlessly. One of the main principles of a Kubernetes deployment is the ‘pods’ approach. A Kubernetes pod represents a running process on the cluster, and is considered the smallest and simplest unit in the Kubernetes object model that can be created or deployed. The Management Pod: contains the platform’s management components, namely the Lookup Service (LUS) used by services to discover each other, the REST Manager for remotely managing the environment from any platform, and Apache Zookeeper for Space leader election. The Data Pod: is analogous to the Processing Unit instance in the platform. Each Data Pod contains a single Processing Unit instance that provides cloud-native support using the Kubernetes built-in controllers, such as auto-scaling and self-healing. 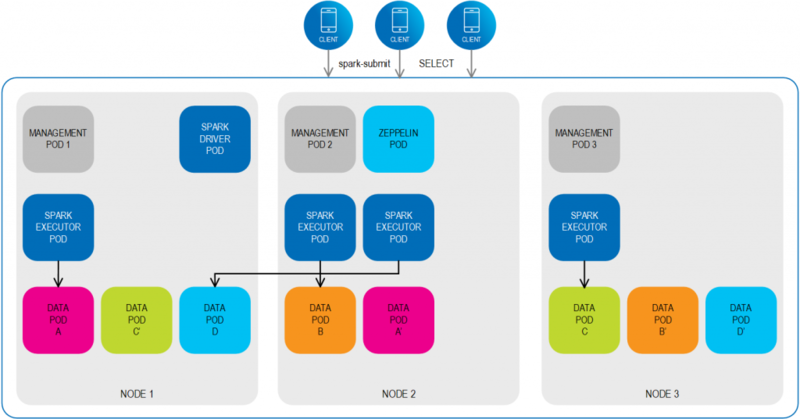 The Driver Pod: contains the Spark Driver, which creates Spark Executors, connects to them and executes the required application code. When the application completes, the Driver Pod persists the logs and shuts down, remaining in completed state. The Executor Pod: contains Spark Executor, which runs the Spark job on the data in the co-located Data Pod. When the application completes and the Spark jobs are no longer required, the Executor Pod terminates. The Zeppelin Pod: contains the Apache Zeppelin web-based notebook. It enables data-driven, interactive data analytics on the platform. In a Kubernetes deployment of InsightEdge everything is based on the Kubernetes pods, specifically the Data Pods, the Management Pods, which includes the different elements (e.g. ZooKeeper and REST Manager), the Spark Driver and Executor Pods, and the Zeppelin Pod. Each pod is standalone and is monitored by Kubernetes, making it easy to recover without dependencies, in case of a failure. Moreover, through the Kubernetes dashboard, DevOps have access to a holistic view of all the pods that are available, and can easily monitor the different resources, e.g. CPU and memory, and their consumption. Helm, the de facto Kubernetes package manager is used for installing InsightEdge in the Kubernetes environment. Among the main advantages of using Helm is that it makes deploying complex applications more portable, it supports automatic rollbacks, and it is a familiar pattern for developers that is easy to understand. Moreover, since Helm is open source, there are many community charts available with standard configurations for common application services. If you are looking to download and amend open source Kubernetes charts for your own organization, you can do so from the Kubeapps Hub. In our installation, a Helm chart is used to describe all the components for deployment, e.g. the manager, the data, Zeppelin, etc. The Helm chart can be used in a variety of formats and locations; packaged, unpackaged, accessed via a remote URL or a chart repository. Once you take these steps, all you need to define are the resources, number of nodes, whether the installation should be HA-enabled (high availability), and whether the installation/deployment is for a production, testing, or staging environment. High Availability is a must for mission-critical applications and can be assured by configuring each primary Data Pod with a minimum of one backup Data Pod, and three Management Pods to be deployed instead of one, so that a quorum of Platform Managers is always available to manage the data pods. Both the Data Pods and the Management Pods should have the Pod anti-affinity property set to ‘true,’ so that the primary/backup sets and the managers are deployed on different nodes. This enables successful failover if a node gets disrupted. Supporting Kubernetes empowers insight-driven organizations to build innovative real-time solutions, with the speed and confidence required to support their business initiatives while optimizing their TCO. Stay tuned for the next blog post on how to deploy machine learning jobs with Spark and visualize it with Apache Zeppelin on a cloud-native Kubernetes deployment. Read the 2nd part to learn more. To learn about how to achieve a seamless, automated, and cloud-native installation and deployment of InsightEdge, listen to our on-demand Kubernetes webinar recording.